BookBub’s team is made up of book editors and software engineers, consumer marketing experts and published authors, recent college grads and MBAs. But we all have one thing in common: we love to read. As part of our ongoing effort to provide our partners with some insight into the people behind your book promotions, we want to tell you about one of our favorite company-wide activities: BookBub Book Club. Once a month, the BookBub team gathers to discuss that month’s selection over the tried-and-true book club fare of wine and cheese. With no shortage to choose from, every book we read is a title that was featured on BookBub and chosen by a company-wide vote. While everyone in the office reads, our tastes vary as much as our backgrounds. For many, this was the first science fiction book they’d ever read. Most enjoyed it more than they expected to, and some were surprised that the book actually seemed more like historical fiction (again! ), but our resident scifi fans confirmed that time travel and Connie Willis epitomize the genre. Of course, people’s reactions to the books are often informed by their own backgrounds. For example, we found it unsurprising when our co-founder and CEO Josh Schanker wondered why more commercial uses for time travel hadn’t been developed in Willis’ future. We voiced our own theories about who would turn out to be the mysterious Mr. C. (Spoiler alert: Mike from the engineering team knew it was the butler as soon as Verity said, “It’s always the butler”). After an extended discussion about the workings of “the net” that whisks historians between centuries, we all agreed that the characters were one of the book’s best features. Down to earth, relatable, and funny, Ned and Verity were lovable leads. And of course, Cyril the bulldog stole the show for everyone (BookBubbers love dogs as much as our subscribers do). We have two resident Brits in the house, who assured us that “spending a few years in America” would be an acceptable explanation for time traveler Ned’s strange behavior to the people of Victorian England (and even to contemporary Brits, for that matter). Overall, To Say Nothing of the Dog has been one of the most universally liked books we’ve read so far. 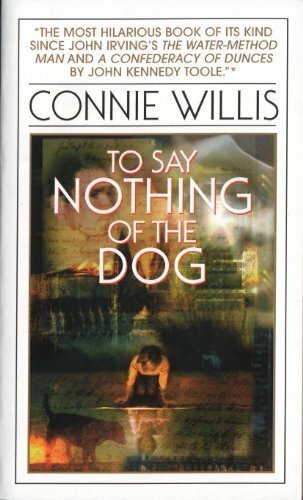 We finished the night by reading about Connie Willis herself, and agreeing that she is a very talented lady who we would all love to meet! If you’d like to read along with us next month, we’ve chosen Pines by Blake Crouch for our next book, which we featured on March 6. Follow @BookBubPartners on Twitter for more updates from BookBub Unbound!